There are 9 Memory Care Facilities in the Providence area, with 4 in Providence and 5 nearby. The average cost of memory care in Providence is $5,450 per month. This is higher than the national median of $4,650. Cheaper nearby regions include Cranston with an average starting cost of $5,000. To help you with your search, browse the 12 reviews below for memory care facilities in Providence. Better rated regions include Cranston with an average rating of 5.0 out of 5 stars. Caring.com has helped thousands of families find high-quality senior care. To speak with one of our Family Advisors about memory care options and costs in Providence, call (855) 863-8283. Rhode Island may be the smallest state in the U.S., but within the capital Providence there is a big community of institutions doing important Alzheimer's disease and dementia research. These include Butler Hospital and, in conjunction with renowned Brown University, Rhode Island Hospital. In the City of Providence there are 38 senior communities offering memory care, and 143 in surrounding Providence County. It is a young and vibrant city, where those 65 and over are only 9.6 percent of the city's population. The median age in Providence is just under 30, much lower than the current national median of nearly 40. The government of Rhode Island has developed a state plan to address Alzheimer's Disease and related disorders including standardizing terminology to describe memory care facilities and the services they offer and provide for accreditation. The state is also aiming at the education of facility care providers and the dissemination of local research findings for the greater good. The weather in coastal Providence has warm, but not oppressive, summers and fairly cold winters which can limit outdoor activities for seniors to three seasons. The local temperature varies from a high of 80F in the summer to a low of 20F in the winter, with 10 inches more snow and rain per year than the national average. The city of Providence has significantly more property and violent crime than the national average, making it necessary for seniors to be careful when going out for an evening and take precautions to protect their homes. Kiplinger rates Rhode Island not tax-friendly and notes that the state is trying to pull back from its extensive taxation of retirees. Going beyond its tax-intensive neighbor to the north, Massachusetts, Rhode Island even taxes Social Security benefits, though it has now increased the income threshold in that area. The maximum tax rate of 9.9 percent has also been lowered to 5.99 percent. For 2018, Providence received a D in air quality from the American Lung Association. Although the organization noted a few years ago that conditions were improving, it still expressed concern that residents of Rhode Island, especially seniors, are at significant risk of respiratory problems. Memory Care costs in Providence start around $5,450 per month on average, while the nationwide average cost of memory care is $4,799 per month. It’s important to note that memory care rates in Providence and the surrounding suburbs can vary widely based on factors such as location, the level of care needed, apartment size and the types of amenities offered at each community. Providence and the surrounding area are home to numerous government agencies and non-profit organizations offering help for seniors searching for or currently residing in an assisted living community. These organizations can also provide assistance in a number of other eldercare services such as geriatric care management, elder law advice, estate planning, finding home care and health and wellness programs. To see a list of free memory care resources in Providence, please visit our Assisted Living in Rhode Island page. 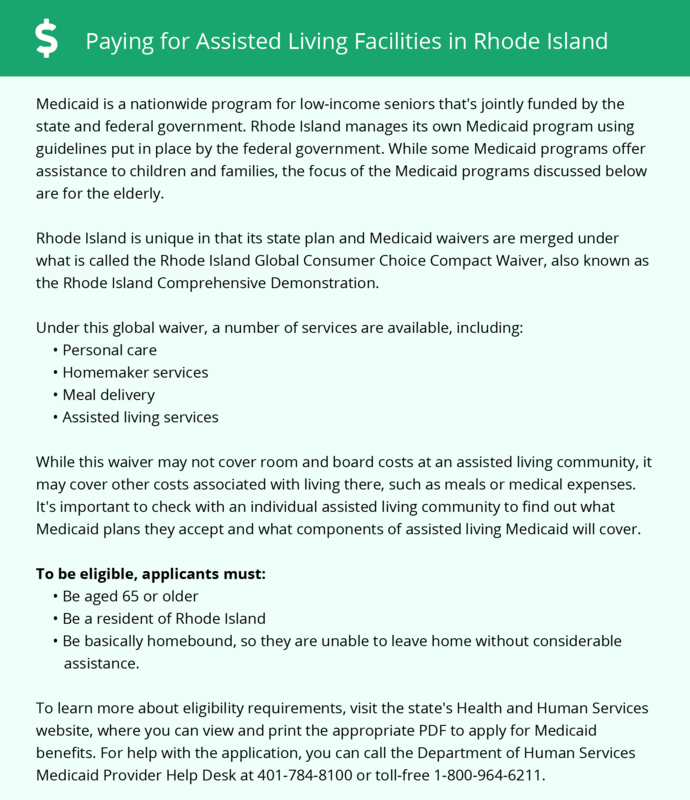 Providence-area assisted living communities must adhere to the comprehensive set of state laws and regulations that all assisted living communities in Rhode Island are required to follow. Visit our Memory Care in Rhode Island page for more information about these laws.